Frequently recurring Spanish surname, often found combined with other surnames, as "Bueno Enriquez," "Gomez Enriquez," "Gabay Enriquez," etc. Many Maranos in Spain, Portugal, Amsterdam, London, Jamaica, Surinam, Barbados, New York, and other places, bear this name. Aaron Mendes Enriquez, physician at Amsterdam in 1680. The "Opuscula" of De Barrios contain a letter addressed to him. Abraham Baruch Enriquez, of Amsterdam; member of the Academy of Poets founded by Manuel de Belmonte, and a friend of the Spanish poetAbraham Gomez Silveyra, whose "Dialogos Burlescos" he transcribed into a magnificent folio volume of 244 pages. An unknown relative in Tripoli sent him a letter, dated Oct. 29, 1668, expressing disapproval of the utterances of Isaac Cardoso and Isaac Orobio de Castro concerning the Messiah. Abraham Nuñez Henriquez, of Amsterdam; the administrator of the charitable institution Abi Yetomim. David Nuñez Torres (1690) dedicated a sermon to him. Another Abraham Nuñez Henriquez owned a plantation in Jamaica in 1760. 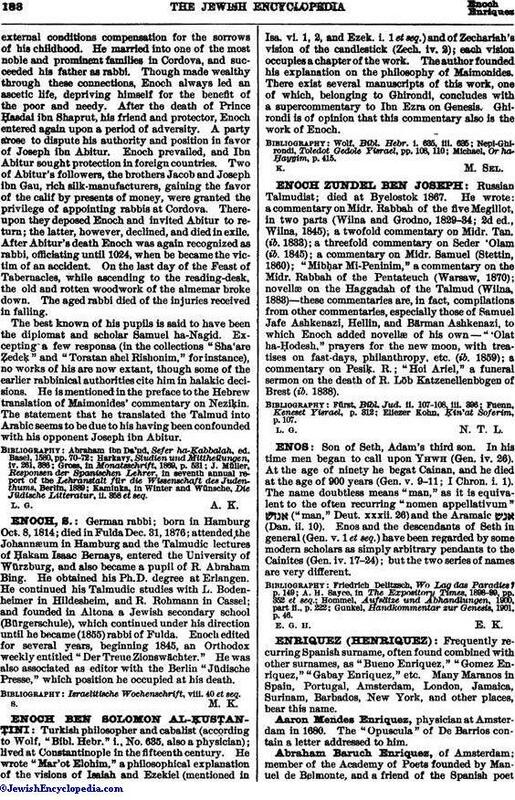 He had a relative, Moses Nuñez Henriquez, who was known in Jamaica in 1745. Isaac Nuñez Henriquez, of Hamburg; Abraham Cohen Pimentel (1688) dedicated his "Discursos" to him. Another Isaac Nuñez Henriquez lived in Georgia in 1733. He was probably the Isaac Nuñez Henriquez who settled in New York in 1741. A third Isaac Nuñez Henriquez emigrated to Savannah, and died in Philadelphia in 1767. Jacob Cohen Enriquez and Jacob Gabay Enriquez each, in 1642, inscribed a pamphlet to Manasseh ben Israel. Jacob Aboab da Fonseca dedicated (1681) his "Parafrasis" to a "Jacob Enriquez"—probably one of the foregoing. Jacob Nuñez Enriquez, was a wealthy Amsterdam Jew who for some time held the Swedish crown-jewels as security. Daniel Levi de Barrios celebrated him in verse (1686). 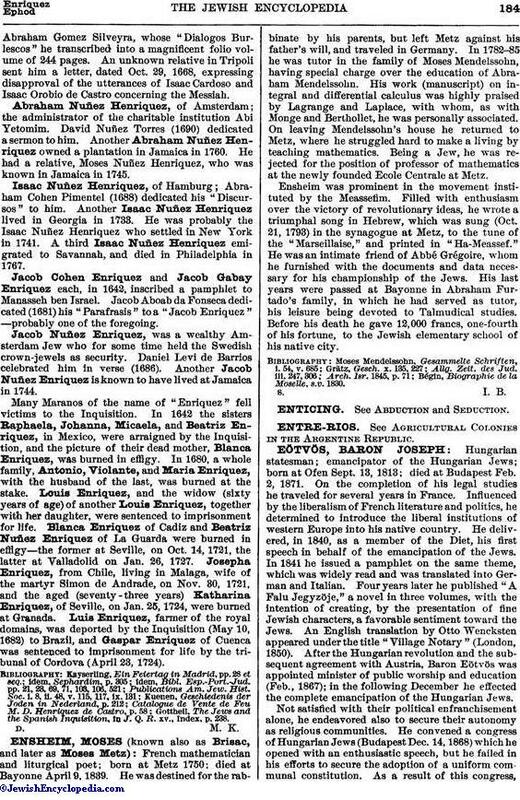 Another Jacob Nuñez Enriquez is known to have lived at Jamaica in 1744. Many Maranos of the name of "Enriquez" fell victims to the Inquisition. In 1642 the sisters Raphaela, Johanna, Micaela, and Beatriz Enriquez, in Mexico, were arraigned by the Inquisition, and the picture of their dead mother, Blanca Enriquez, was burned in effigy. In 1680, a whole family, Antonio, Violante, and Maria Enriquez, with the husband of the last, was burned at the stake. Louis Enriquez, and the widow (sixty years of age) of another Louis Enriquez, together with her daughter, were sentenced to imprisonment for life. Blanca Enriquez of Cadiz and Beatriz Nuñez Enriquez of La Guarda were burned in effigy—the former at Seville, on Oct. 14, 1721, the latter at Valladolid on Jan. 26, 1727. Josepha Enriquez, from Chile, living in Malaga, wife of the martyr Simon de Andrade, on Nov. 30, 1721, and the aged (seventy—three years) Katharina Enriquez, of Seville, on Jan. 25, 1724, were burned at Granada. Luis Enriquez, farmer of the royal domains, was deported by the Inquisition (May 10, 1682) to Brazil, and Gaspar Enriquez of Cuenca was sentenced to imprisonment for life by the tribunal of Cordova (April 23, 1724). Gottheil, The Jews and the Spanish Inquisition, in J. Q. R. xv., Index, p. 238.